Dumbledore sees what his heart really wants in The Crimes of Grindelwald. Months ago, Fantastic Beasts: The Crimes of Grindelwald director David Yates courted controversy among some Harry Potter fans by saying that the movie—despite featuring a young Dumbledore grappling with confronting his now-villainous love interest—would not address author J.K. Rowling’s post-book reveal that Dumbledore is gay. Now he’s walking that back, ever so slightly. Speaking to Entertainment Weekly back in January, Yates said the Fantastic Beasts follow up, which features Jude Law as the young Dumbledore, would “not explicitly” acknowledge the character’s sexuality. Instead, it would be left up to fans—who already knew of Rowling’s 2007 revelation that Dumbledore was in love with Fantastic Beast 2's titular villain, Gellert Grindelwald—to take subtext into account rather than have the movie itself actually portray it in some way. It is, apparently, still a monstrously difficult thing for a Hollywood genre movie to do in 2018—despite actually not being that hard at all, unless someone had happened to apparate your spine out of your body just before you had to make a decision about making LGBTQ subtext actual text. But anyway! In that earlier interview, I didn’t say Dumbledore’s not gay. He is. This part of this huge narrative that Jo is creating doesn’t focus on his sexuality, but we’re not airbrushing or hiding it… the story [of the romantic relationship] isn’t there in this particular movie but it’s clear in what you see… that he is gay. A couple of scenes we shot are very sensual moments of him and the young Grindelwald. Just, I dunno, imagine a bit of “Careless Whisper” playing in the background. So, it is at the very least a tiny step in the right direction, if not quite an actual full step. Yates’ latest comment still dances around the real source of consternation—as sensual as mirror-touching might be, it’s still not an actual explicit acknowledgment that Dumbledore is gay. If the film never actually states that Dumbledore is gay (and no, we’re not talking about him shouting “I’M GAY!” to kick off a Quidditch match), and instead leaves it to these scenes to be interpreted by fans, then it’s deliberately left in limbo. Enough visual hinting so that fans can see the pointed nod of what it means that Dumbledore sees his former crush in the mirror of desire, but still vague enough that viewers who aren’t familiar with Potter lore or Rowling’s outside-the-novels commentary are left none the wiser—perhaps assuming that his “desire” is simply to see Grindelwald return to a time when he wasn’t a wizard bigot. Fans hoping for LGBTQ representation on the big screen get more vauge subtext to debate, while viewers who might be concerned to discover that gay people exist in a world of magical monsters and wizarding schools don’t have to worry because a movie mentioned the G-word. Everyone wins! Well, except for actual representation, that is, and the people it matters the world to. 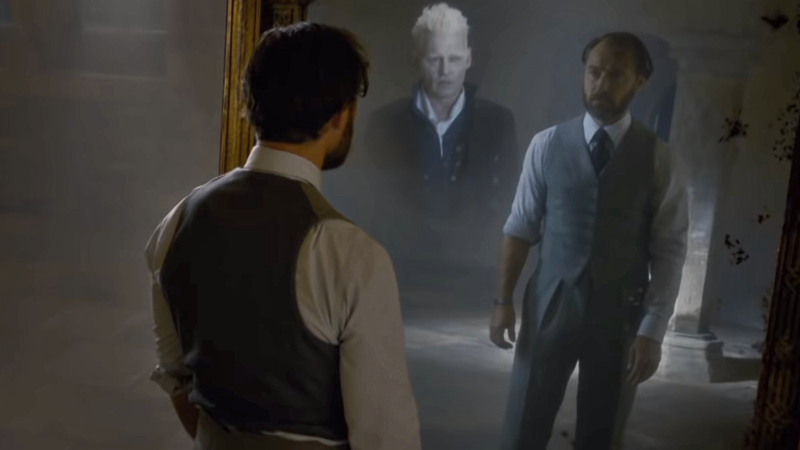 Who knows—maybe there’s more to Crimes of Grindelwald’s Dumbledore stuff than some touchy-feely mirror moments. Maybe it is, unlike Yates’ original comments to the contrary at the start of the year, actually going to explicitly address Dumbledore’s sexuality, and things have changed in the last nine months. We can’t say yet, because the movie’s not out until November 16. But really, if Fantastic Beasts is going all this way to drop hints about Dumbledore and Grindelwald’s past together, why not actually take the step and just say it?